Karina's Kreations: Designer Type Photopolymer Stamps! Have you seen the new Photopolymer stamps yet #132956? They are super sticky and won't fall off your clear glass blocks. Yeah!!!! I love that you can curve them on your block. I did this with the pennant image. Here's a trick to lining up the letters. Stamp the pennant image on card stock. 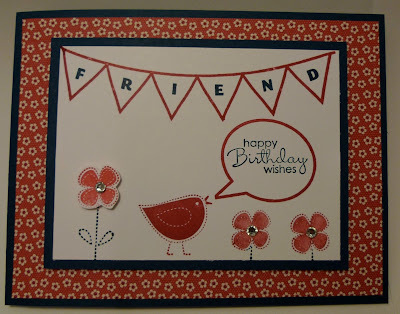 Place the letters in each pennant shape on your card stock. Set a clear glass block on top of the letters. When you pick up the block, the letters are perfectly positioned and ready to stamp! You'll want to buy two sets of this stamp set. You need more letters to spell out words.